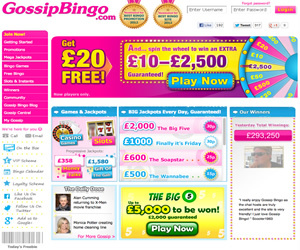 Gossip Bingo opened the pages of their glossy online brand in September 2010 and since then has gone from strength to strength. The brand is from the same company responsible for established sites like Moon and Polo Bingo so it goes without saying that the software used to power the games is the 888/Globalcom offering. Landing at the site for the first time you may be impressed with the big money jackpots promoted on the home page; they are a definitely selling point for Gossip Bingo. There are also details of the welcome bonuses offered by the brand and information about the Spin and Win deal. By clicking 'Play Now' anywhere on the screen you are taken to the main lobby and this is the hub of all the action happening at the site. To the left of the screen is a list of the games starting shortly with the right of the screen advertising just a few of the instant win games available. 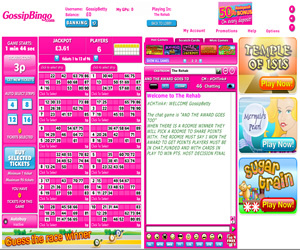 There is a tabular navigation used for 90 ball, 75 ball, Big Jackpots, Slots and Instants, Free Bingo and Kachinga. Should you choose 90 ball for example you will see details of the room names, time until next game, the number of players in the room and the jackpot for the next game. All of this information is useful when trying to find a room that suits your budget and gaming requirements. When in a room the chances are you will feel right at home as the layout is standard to all of the sites using the 888/Globalcom software '“ purchasing options to the left that become the call board when a game is in play, bingo tickets in the centre of your screen and chat (instant win games above) to your left. Gossip Bingo offers the bingo game types 75 ball pattern and 90 ball being the most prevalent, but you will also find some games are 75 ball multi-line. Please note that if you want to play 75 ball games there are no rooms open from midnight until 10am offering this game type. The brand is a standalone site but the promotional schedule is a little poor in our opinion. Whilst the site does offer free bingo, only one of the three no cost rooms are open to non-depositing players. 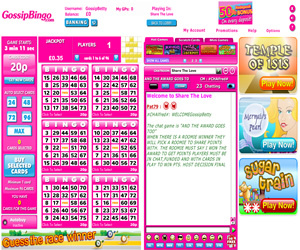 Gossip Bingo isn't really a site that you would 'gossip' about with your mates but it's okay. 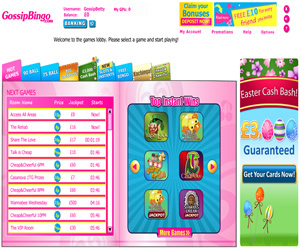 Gossip Bingo offers three different types of bingo game at their site. You are offered 75 ball pattern and five line games as well as 90 ball in a number of rooms. In addition there are a number of instant win games available. Some of these open in seperate windows to your bingo game whilst others are embedded into the same screen. The minimum deposit required is £5 but £10 to claim 1st bonus. The wagering requirements are 4x the amount of deposit and bonus received from Gossip Bingo but withdrawals can be processed prior to meeting these requirements if you have met the above requirements for minimum withdrawals.